slate wall by the silken streamside and bluebell groves of the Lakes in summer. 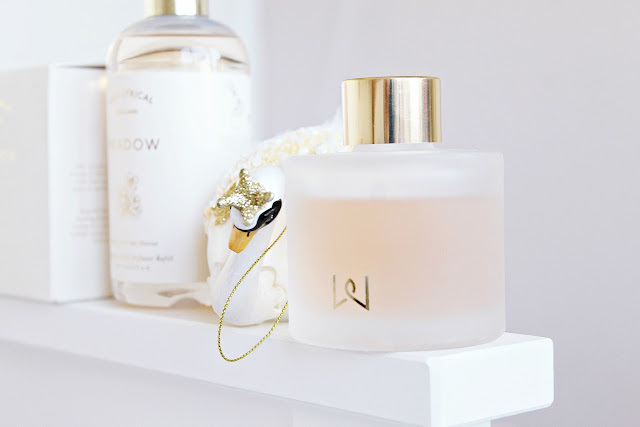 I wrote about the Wax Lyrical Meadow range on my blog back in December but they have become such staples for this midsummer loving girl I inhale them at every opportunity I needed to give this range a little more 'air' time. 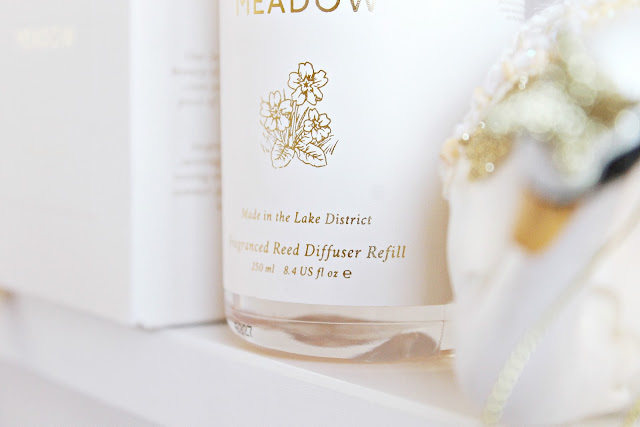 The Meadow range consists of the boxed glass candle, 100ml reed diffuser and 250ml reed diffuser refill. All are full sized, come lovingly wrapped and share the same heady, milky, lush floral scent. It's inspired by the sweet, green meadows in summer in the Lake District and made locally, just south of me, in Ulverston. The packaging is seriously dreamy and exudes shabby chic vibes. It feels luxurious, textured cream cardboard with gold writing and adornments. These would make such beautiful gifts, whether given as wedding presents or just a little pick me up for someone who has been struggling through the cold winter months. First up is the candle. It's of such a lovely size and weight and lasts for ages, made with frosted glass inside a pretty box. I would love to see them make a 3 wick candle as they would look so beautiful! I can only describe the scent as sweet, balmy, soothing and floral; there is a silky, creamy edge to it, if that makes sense. 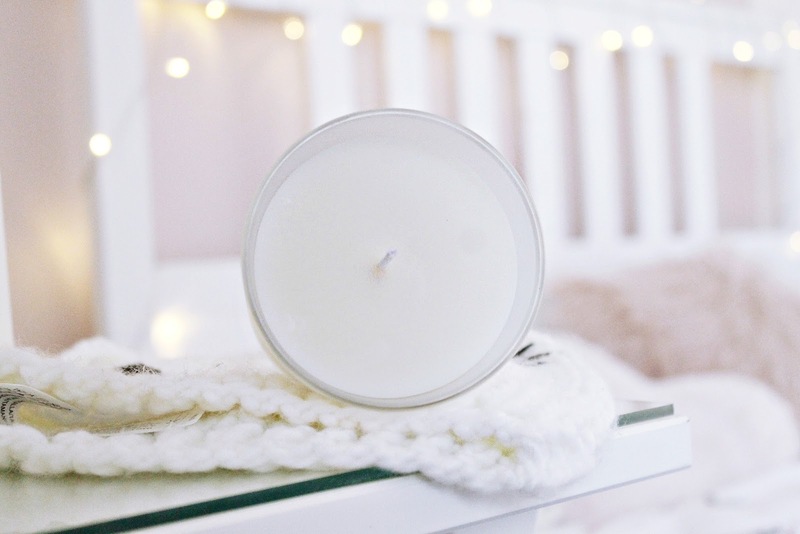 The candle offers a really nice amount of throw, the delicate aroma quickly spreads around your home. It's such a sunny scent, the perfect backdrop for your spring clean and letting out the dust and the cobwebs. 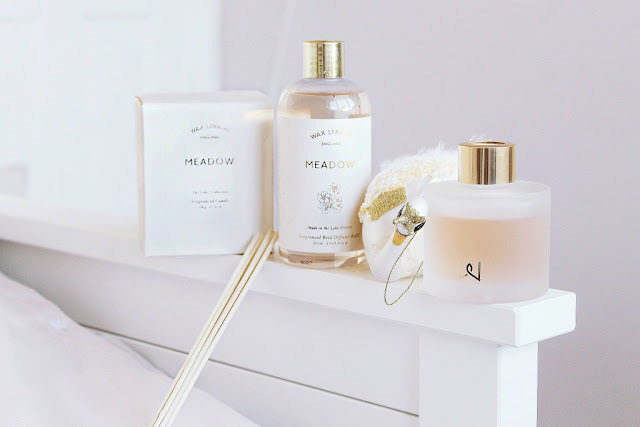 It really does conjure up images of a lush bed of wildflowers, it's the perfect scent for which to open your home with for spring! PS warning, it may very well attract a multitude of woodland animals to your home. 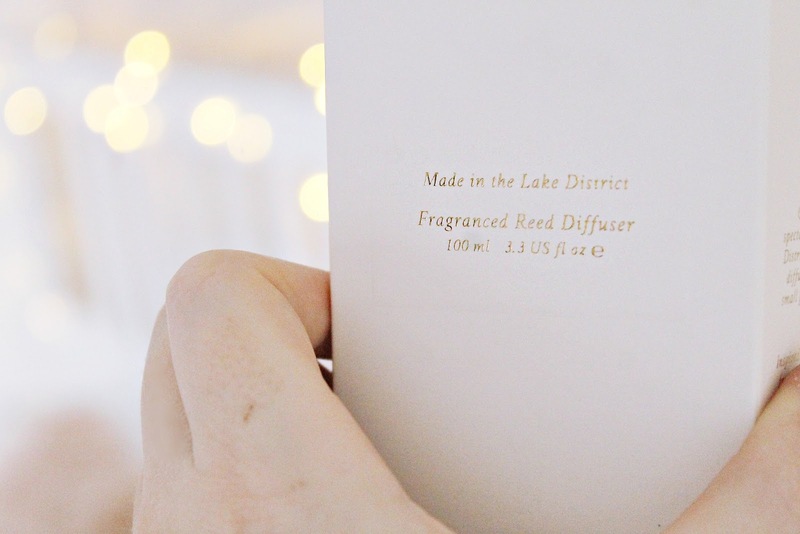 The reed diffuser smells like a freshly picked bouquet in your home and is just as pretty! 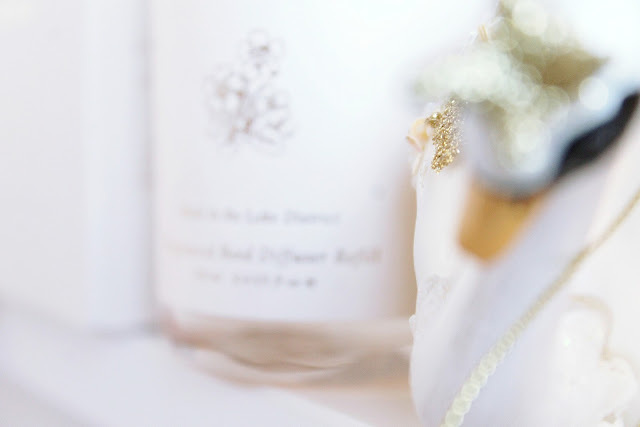 The bottle is so luxurious with its frosted glass and looks stunning on your mantelpiece be still my shabby chic heart. The fragrance is subtle, it's sweet and floral but not overpowering. Our living room smells like a fairy grove! I'm really in love with this range, I can't wait to try more from the Lakes collection. There's something about the sweet, buttery, nectar fragrance that turns me in to a bee in flight and I think only of grassy plains and meadow flowers, adventures and midsummer. The candle is my favourite, I really recommend it! All are available to purchase at Wax Lyrical, John Lewis, Royal Worcester and Amazon and are perfect for restoring a little summer to your home. I've been struggling through this dark, cold month and been feeling overwhelmed but reading your comments really helps, more than you know ♡ have you found yourself willing the days to pass as quickly as they do in the warmer months? 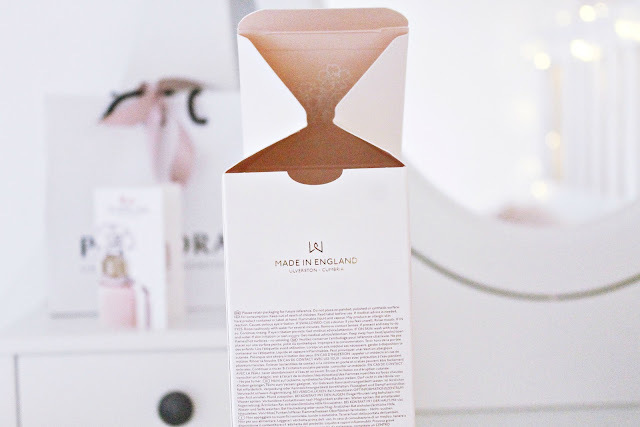 Love the packaging on these, I've always had an obsession with candles and fragrances! The candles look especially conciliating and pretty. I love it! After all, I'm growing slightly tired of the Christmassy/end of Christmas-scented candles. I would like something fresh but cosy at the same time. Oooh this sounds lush! I was going to comment on how pretty and chic the packaging was, but you got there before me tehe. I've never used a reed diffuser before as I am such a sucker for pretty candles (I bought so many from Primark lately) but I am tempted to try it out! I usually hate winter, but this year I am all for having a reason to dot fairy lights around my room and lighting candles, so it's not been too bad for me! The packaging is so lovely! It looks just made for you Elizabeth :) I love spring and summer too, especially spring when flowers start growing and days get lighter. The scent seems amazing and perfect for freshen up the home! Ooo that packaging is pretty!